Davem, that's a work of art my friend. The left-hand entrances and exits will sink it in the eyes of present-day MassDOT engineers, methinks. I encourage all of you to come to the meeting on April 10th. Yes, please do come to the meeting on the 10th. That is really the best way to broaden the scope of the conversation and help MassDOT, our elected officials, BTD, the media, and our neighbors start thinking bigger. Can you elaborate as to why? Do they just not like left-hand ramps? As long as they are well-signed, I've never had a problem using them elsewhere. Part what I keep wondering if we take DaveM's vision and combine with some with ramps around Charlesgate, we can make Storrow Drive unnecessary from BU bridge (or University Rd exit) to the Back St Exits. As long we put the tolls west of the new exits, The Pike would do the job. Storrow can continue to exist From Back St. and eastward including Charles MGH and everything. It seems doable to re-rig it to enter on the right side anyway. The ramps just have either go under or over the Pike though it may eliminate a street if just done simply as possible. DaveM's can you remake it with right side entrances? Or is there a reason why it was done of the left? Well, they're poor road design in general because they counteract the natural flow pattern. Left-hand lanes of highways are intended as through lanes with high speeds, and drivers should be able to reasonably expect that. Sometimes, if signed and engineered correctly, you can change the set-up from "left-hand exit" to "highway split". In that case, the road flows at equal speed in all lanes and drivers simply have to line themselves up properly. In this special case, Dave's actually set up what effectively amounts to parallel roads with a pass-between segment. I don't think MassDOT would go for it, since the mainline of I-90 would theoretically be uninterrupted there (and because they and FHWA have made blanket statements against LH exits), but if you sign the hell out of it as far back as the Cambridge St. overpass it might not be too confusing. The real issue here is that if the exit to Storrow were on the right side, drivers couldn't get between SFR and Storrow without using surface roads or without the plan including another, dedicated ramp. Storrow Drive cannot easily be eliminated. It would have negative repercussions on the traffic flows in that area of Boston. Boston needs Storrow Drive. It needs it now. With the proper supports and changes in place, it would not necessarily need it forever. This is partially true. Boston will always need Storrow in some form - the Turnpike is simply not parallel as many on these forums would like to believe it is. If, however, access were provided from the Bowker to the Turnpike, it might be possible to reduce sections of Storrow. In an extreme world, you might be able to remove it entirely west of Charlesgate and direct all traffic onto the Bowker toward the Pike. Eliminating Storrow Drive would be worth slightly degrading the Mass Pike to below modern highway standards in order to shoehorn in short left-side ramps. It's very absolutist to say that Boston will always need Storrow in some form. I don't necessarily advocate the elimination of Storrow completely (that's but one of many options for that corridor), but to say that the Boston of the future could not possibly ever function without it is a stretch. I did qualify it. As long as the Turnpike and Storrow Drive go to opposite extremes of the Shawmut Peninsula, and as long as there are things at the northern extreme that people wish to get to from points west, and as long as Memorial Drive is not turned into a high-capacity road, Storrow Drive will continue to be necessary. Reduce it? Add some stoplights? Deck it? Maybe, in time, but you can't eliminate it. The Riverbank Subway might replicate some of the through capacity on the corridor, but it serves completely different travel patterns, unless you think people will drive to a park-and-ride at Kenmore. The issue with that thinking is that it is perfectly possible to reach any point from I-90 that is currently reached using Storrow Drive so although they go to very different parts of the peninsula they are not that far apart and they both connect to I-93 so if more traffic could get on I-90 Storrow Drive wouldn't be as important. This also brings up the question is whether the role of a city is to move as many cars as possible or a place for people to live and interact with. If it is to live in and interact with then the improvement made to the esplanade by removing Storrow Drive or turning it into a regular street would be worth any of the traffic issues that may or may not occur. FWIW, I think the best, practical solution is making Storrow a mini-West Side Highway style project. Two lanes each way with no long leading turning lanes (which essentially makes Storrow a 6 lane highway for most of its run). Boulevard it with signals at the Back Bay cross streets with frequent pedestrian crossings. A lot of land can be reclaimed for the Esplanade, especially from Charles Circle to Charlesgate (Soldiers Field Road is a whole other animal past the BU bridge, by Beacon Yards and all the way through to Harvard). That being said, I do think it's too restrictive to think of Storrow as a sacrosanct roadway that can never, ever be eliminated based on fundamentals. Would removing it it force people to change their habits and patterns? Sure. Would it be impossible to get people to Government Center and the West End and the Garden without it, no. That's not really true. I-93 can be used to access North Station with some effort, but that's about it. Connectivity between the Artery and Charles Circle, Kendall, East Cambridge, etc. is pretty non-existent. 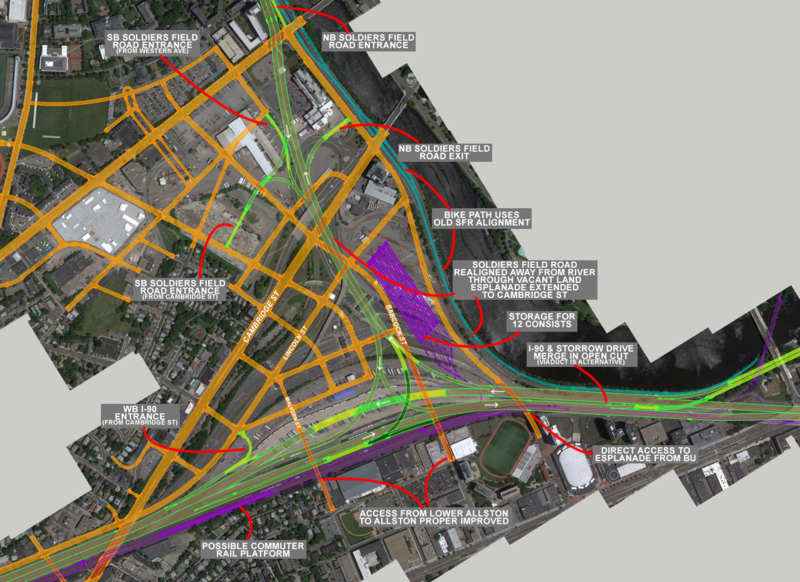 Now, if they had been able to finagle a continuation of the US-1 ramps through North Point to connect with Cambridgeside, that conversation might be different, but what was built was a connector across the river back toward Storrow. In any case, how do you think all those cars would make the connections from the Turnpike? It's not like there's high speed ramps hidden underground somewhere. Do you want to burden the streets around North Station or Government Center with all of Storrow's traffic? I mean, it might be moving slower on more pedestrianized streets, but it's now in the way of pedestrians when it wasn't before. The fact is, Storrow isolates a lot of traffic at the margins of the city and pulls it off of local roads so that most of the city - the vast majority of the city - can be for people as you describe. That's not really true. I-93 can be used to access North Station with some effort, but that's about it. 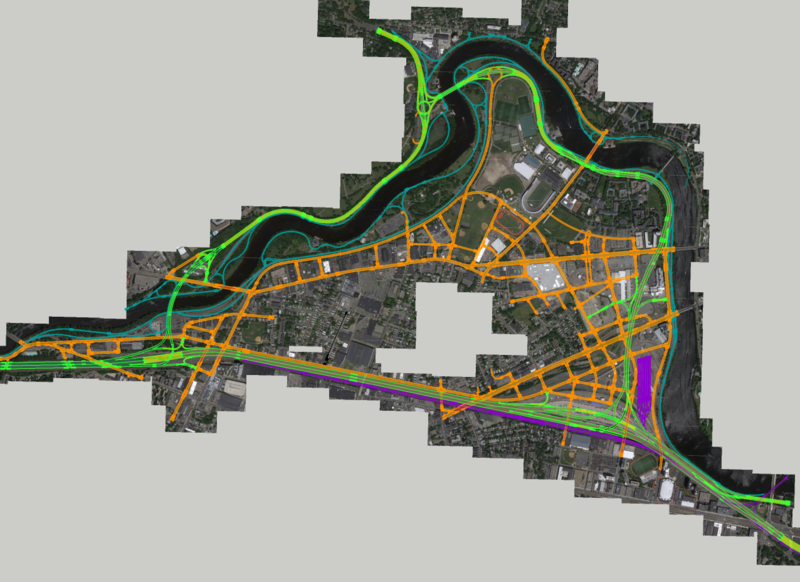 Connectivity between the Artery and Charles Circle, Kendall, East Cambridge, etc. is pretty non-existent. I live around the corner from North Station, and I 100% always use 93 over Storrow if I'm coming in from the west or heading out that way. The absolutely only reason to take Storrow from around North Station over 93 is if you're going to the Back Bay or if you're going to Allston/Brighton/Central Sq and want to avoid the tolls. In terms of Charles Circle, Kendall, and East Cambridge, you can get off at Leverett from 93 easily. Driving through Leverett is another issue, but you'd be doing that anyway if you were on Storrow. In any case, I think the main issue is can Storrow be boulevardized and the answer is pretty clearly yes as long as it's well engineered and the signals are timed right. Getting rid of it completely sort of seems like an answer in search of a solution. I never said you couldn't use 93 for North Station, I said you couldn't use it for East Cambridge, and I stand by that. I grew up in Newton, and any time we would go (or still do) to Cambridgeside, the Museum of Science, or anything around Charles Circle we use Storrow exclusively. The poorly-signed maze from the North Station exit to get back to Leverett is simply not a reasonable way to ask people to get somewhere. That exit functions well for local access, but it's not a distributor. I think if you do it right a boulevard could work. If you're adding 2 minutes to the end-to-end drive in exchange for Blue-to-Kendall, that's a good trade. On the other hand, I don't think you can do just the boulevard, since building the subway in cut-and-cover is most cheaply done concurrently. Good luck getting the T to go for that 2 billion dollar project when they can't even get the subway to Charles/MGH. If Storrow were boulevardized or west-side-highwayed, what do you guys think the chances are of developing some sort of street -level development between Back Street and the present Storrow? The poorly-signed maze from the North Station exit to get back to Leverett is simply not a reasonable way to ask people to get somewhere. But you don't have to get off at the downtown exit. You can get off at the Storrow exit and it drops you directly in Leverett. It's wicked easy. Judging by things BBNA has complained about in the recent past I'd say slim to nil, but never say never I guess.